4H/FFA Members – See General Rules. 4H and FFA Members who wish to participate as an Open Class Exhibitor MUST register using the 2017 Exhibit Registration and Entry Form. PARENTS: If your child is NOT a 4H or FFA member, check out Dept. 11 – Youth Under 19. Eligibility: 4-H Exhibitors must have passed their 8th birthday but not have passed their 19th birthday as of January 1 of the current year. 4-H exhibitors must be active members of a regularly organized 4-H Club, carrying a project in the field in which they wish to make entry, and be under the supervision of the Pennsylvania State University Cooperative Extension Service by June 1. 4-H Livestock Project members need to be enrolled by the ownership deadline date of their particular species. A member is enrolled when his or her 4-H member enrollment form and educational materials fee are given to the Extension Office. 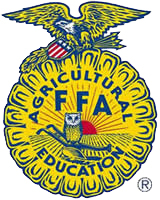 FFA Exhibitors must be enrolled in or have completed an accepted agriculture class and meet the guidelines for membership as outlined by the national FFA Organization. They must be conducting a project in the class or classes in which they wish to make the entry. A Record Book must accompany all projects with entries recorded up to Friday before fair. This rule will be strictly enforced. Fair will furnish a reasonable amount of initial bedding only. 4-H & FFA Club Members may enter Open Class or Youth Competition only if there are no classes in their respective departments (Dairy Cattle, Sheep and Swine departments excluded). Premiums awarded to duplications will be voided. Exhibitors must have all animals entered for competition on the grounds between the hours of 9:00 AM and 1:00 PM, Monday during fair week, except Rabbits, which are entered at 1:00 PM on Sunday. All animals shall remain on the premises as listed under Exhibit Submissions and Exhibit Removals in General Rules. 4-H member entries considered perishable (food items, cut flowers, herbs, fruits, and vegetables) must be entered on Saturday following 4-H Round-Up judging. All entries limited to Union County 4-H and FFA Club Members. 4-H and FFA members who wish to show animals must take the required Quality Assurance/Ethics Trainings.